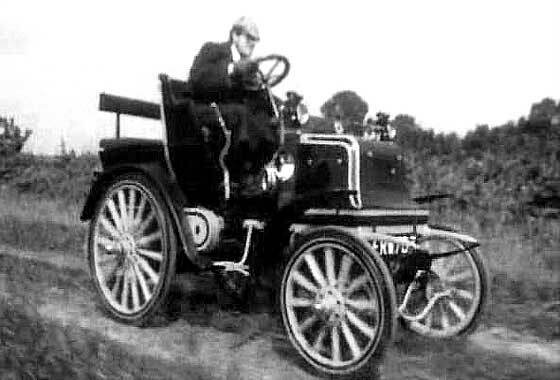 Another cinema screen grab of a vehicle which appeared in a British Documentary " History of the Motor Car" made in 1999. Featured in one of six parts chronicling the development of the motor car. -- This car is a cca 1898 Daimler Grafton Phaeton manufactured in the UK after Harry Lawson purchased the Daimler Motor Syndicate from Fredrick Simms and Gottlieb Daimler. 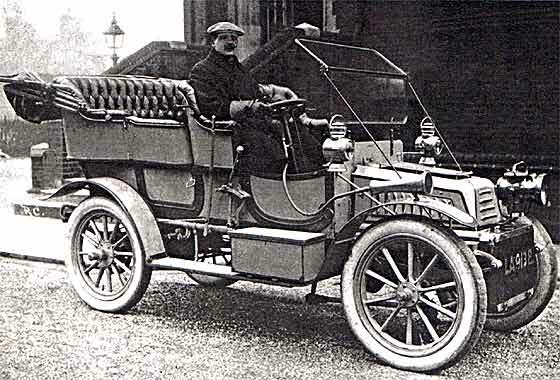 UK Daimlers started in 1897 having front Panhard type engines and tiller steering, - changed to wheel steering. Another cinema screen grab of a vehicle which appeared in a Documentary " That was the Year: 1977 " made in 1991, where the vehicles are being investigated by IMCDB. -- Two cars are depicted. By the vapour trail the left hand one is easy to determine as a 'steamer'. The one on the right is a Vis-a-Vis, front low mounted rad, and has a three word make logo on the front. The first word has only two letters. The cars are left a cca 1899 Locomobile and right 1901 De Dion Bouton. A photo received from Gail Silverman (UK) of her Grandfather taken in around 1920-30. He lived in Holland Grove, Kennington at the time and worked as Head Hall Porter at Whites Hotel in Bayswater. -- We have had some difficulty in identifying the car until John Warburton sent the photo to David Hales who identified it immediately, having written about this car in the Automobile in 1995. It is a 1904 15HP New Orleans, made in Twickenham UK, based on Belgian Vivinus, - costing then £561. Fascinating photo submitted by Ken Brown (UK) relating to the Tomdoun Hotel. The younger lady is the Aunt of a neighbour. -- Immediate thought was Argyll but some things did not tie in. Our John Warburton had a 'eureka' moment and suggested a Swift. 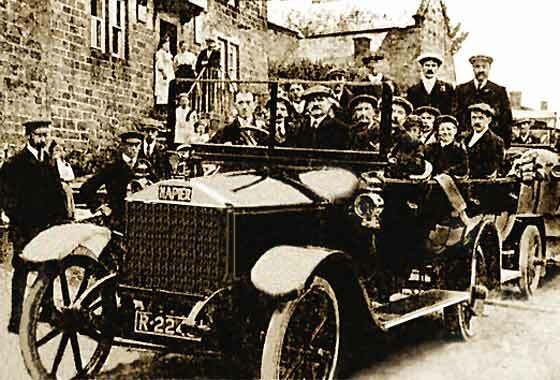 Swift Owners Club were not initially sure sure but dug into their records and did eventually provide a copy of a 1908 leaflet where many things agree to a cca 1909 Swift Tourer, possibly questioning year and model 12/24. One of three very interesting photos submitted by Janis Dumpis of Riga (Latvia). 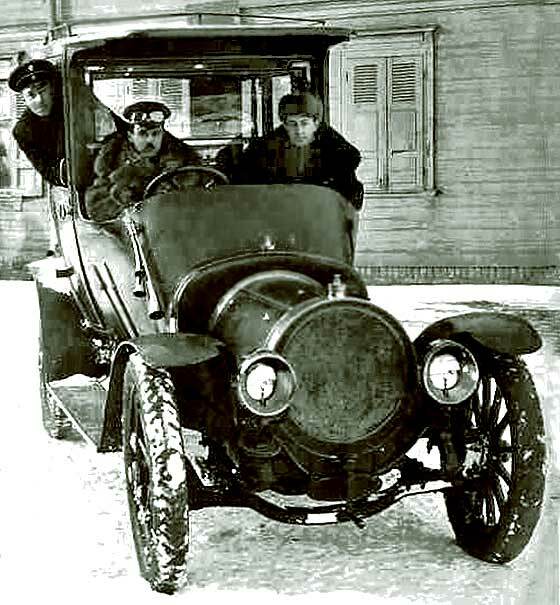 This picture shows a rather nice town car not very warm for those in the front seat. -- The car is a cca 1909 Delaunay-Bellville, made by one of France's highest quality car makers. The radiator and the bonnet are distinctively circular said to have been inspired by their boiler-making background. 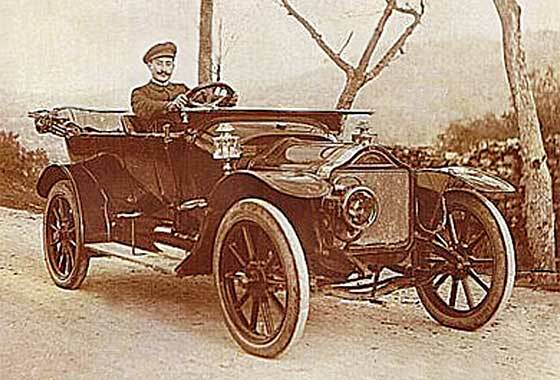 Quality car with formal bodies favoured by Czar Nicholas of Russia, kings of Greece and Spain, & French president. Small photograph received from Cosmo Schiavo of Salerno (Italy) saying he hope we can help him identify a vintage car. We emailed him for further clarification and background but did not receive the courtesy of a reply. -- This one did the rounds of all our experts and various suggestions had been put forward. Finally positively identified by Bryan Goodman as a French "Stimula" manufactured by De La Chapelle Freres et Cie, at St Chamond, Loire. Cars made 1907 to 1914. Damaged (by us repaired) photo submitted by Harold Balbach, Co-President, Board of Trustees Champaign County Historical Museum (USA) from the collection of a prominent local family. -- This is a cca 1916 Roamer Six Sedan with bespoke coachwork (perhaps prototype) probably designed by Karl H. Martin. Springs confirm the early dating. 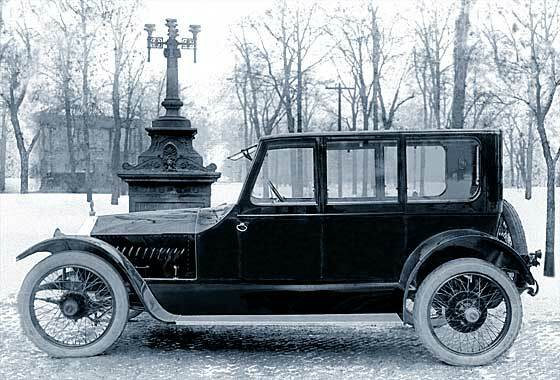 Post 1917, the bonnet had only a few louvers at the back. Was then manufactured up the road in Streator but moved to Kalamzoo in 1917. Another of a number of very interesting photos submitted by George Wigglesworth (UK) who is assembling the history of his local villages in Derbyshire. This picture headed "Two 'charas' for a village trip outside the 'Three Horse Shoes' pub [now a private house] Lea, near Matlock, Derbyshire. Alas no names of people or date. -- Early Derby registration dating lost. Napier built lorries for the War Department. This looks a cca 1914-18 Napier Lorry with a post WW1 Charabanc body. Another of a number of very interesting photos submitted by George Wigglesworth (UK) who is assembling the history of his local villages in Derbyshire. This picture is from Dethick, Lea and Holloway. 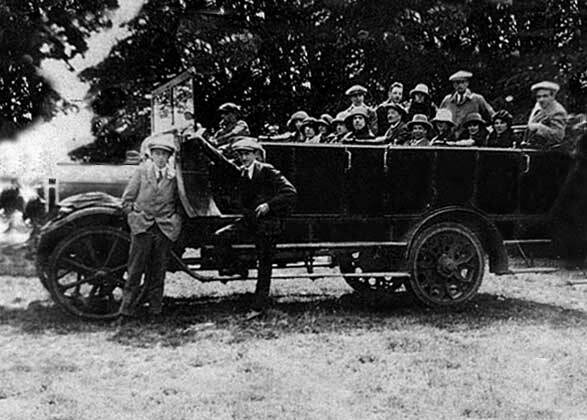 'The driver was said to be Bert Thorpe. Fred at front, Alice back corner, Percy behind her.' 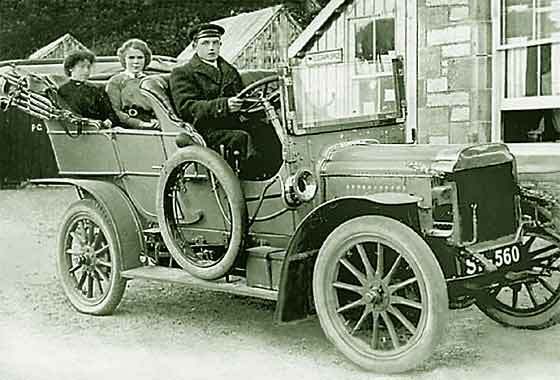 -- The photo is damaged at the all important radiator but the little square over the black upright on the rad side and the cast back and front wheels all very much suggest a cca 1920 Daimler Charabanc. A photo received from Fred Reider of Racine, Wisconsin (USA) asking if we can tell him the make, model and year of the attached vehicle photographed in Spain in approximately 1955? -- This one is relatively easy as I have one exactly the same in the garage! 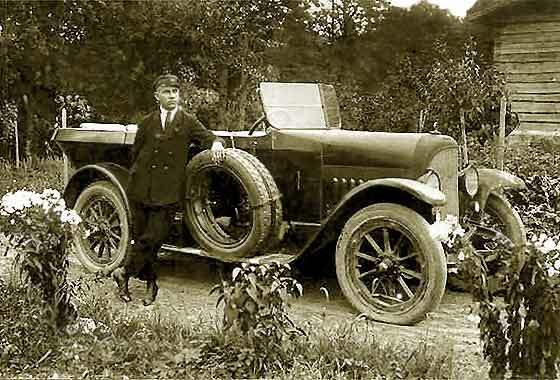 Photo shows a Citroen 5CV C3 Cabriolet probably cca 1923/24 as it has flat mudguards. Chassis Engine number could date it more accurately. For more info on the model C see my website and for more info on my car see web page. One of three very interesting photos submitted by Janis Dumpis of Riga (Latvia). No background advised to this photo. -- This is a cca 1924 Stoewer Tulip Bodied Phaeton. This style of body was much favoured in Northern Europe during this period distinguished by the curved overhang of the rear part of the body which is said to resemble a Tulip. Stoewer was a German manufacturer in Stettin on the Baltic coast, now Szczecin, part of Poland. Made cars, trucks and aero engines upto 1944. Possibly quite unique photo received from Fred Reider of Racine, Wisconsin (USA) asking if we can tell him the make, model and year of the attached vehicle photographed in 1955 Spain? -- There seems to be no records anywhere of this model apart from a two page document at the Berliet Foundation (now housing Renault archives, - thanks!) advising that this was a cca 1925 Renault Model MR1 cab-over-engine chassis. 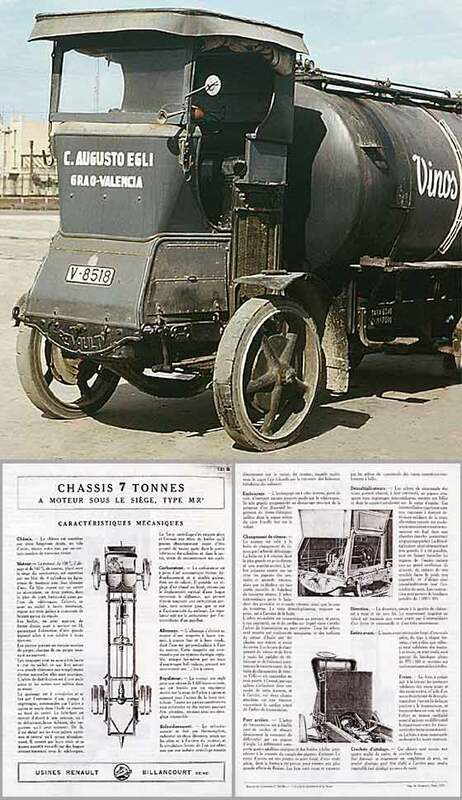 Renault made the chassis and engine, the wine tank by others. Another of a number of very interesting photos submitted by George Wigglesworth (UK) who is assembling the history of his local villages in Derbyshire. Lorry from John Smedley's knitware factory, decorated for an event in Dethick, Lea and Holloway near Matlock. No date or names. They had a tradition of generous support for their workers and the three villages. There is also a car behind. -- Not a car but a truck, cca1929 Morris Commercial. 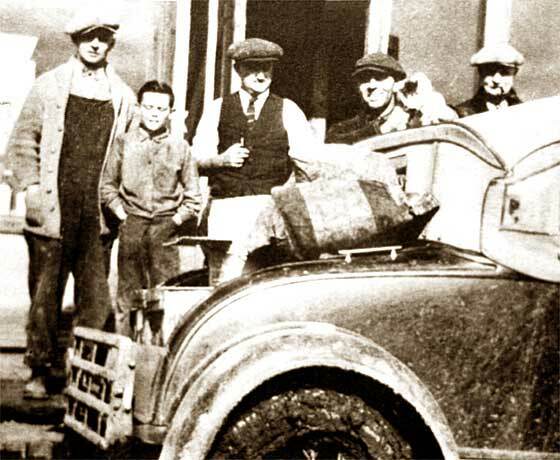 In foreground is a cca 1927 Dennis Lorry. 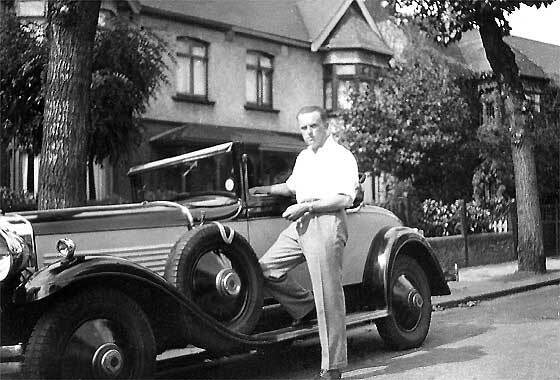 Photo received from Derek Loney of Hebden Bridge, West Yorkshire (UK) of his uncle in possibly a Stutz Model MB LeBaron. 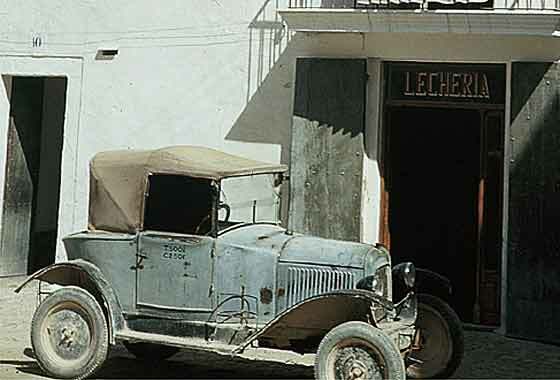 While working in Argentina during the 1930s had an Auburn 12 Convertible and a 1930 Chevrolet Rumble Seat Roadster. He died in BA in 1937. -- We agree that this is a Stutz but our friends at AACA do not think it is a LeBaron. LeBaron were a specialist coachbuilder with a badge, whereas this looks more like a cca 1929 Stutz Model M Convertible Coupe, body by Stulz. Another of a number of very interesting photos submitted by George Wigglesworth (UK) who is assembling the history of his local villages in Derbyshire. This picture is from relatives in Canada, photographed in Canada. -- It is always much more difficult to tell a make of the car from the back but our friends at the AACA immediately advised that this is a cca 1930/31 Ford Model A De Luxe Roadster with a missing dickie or "rumble" seat. Note wheel chains to overcome muddy roads. A photo received from Bob Cakebread (UK) part of a collection of official press release photographs. Having got involved with bus construction during his days at the Department for Transport, he wanted to know what this bus operated by Bradford City Tramways was. He wanted to know the chassis and body manufacturer. -- When enlarged, the badge on the rad says it is a Leyland. 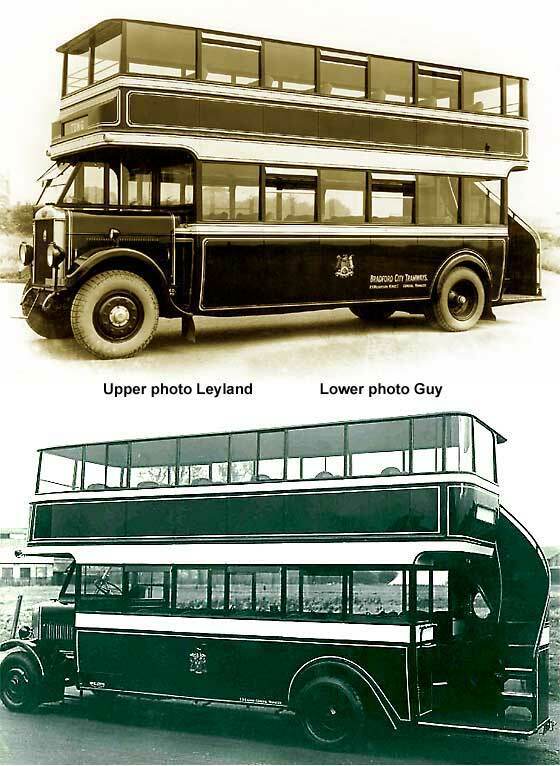 A photo of a very similar 1930 Guy bus advised the body was Park Royal Vehicles London. A photo received from Owen Matthews (UK) of a car belonging his great granduncle James Woodrow Matthews, Lloyds broker and benefactor of Topsham Town Hall. What model of Minerva was this? -- Not a Minerva as no distinctive shape of radiator top. 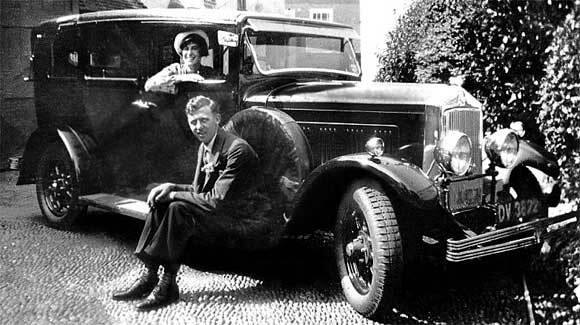 Had us baffled for a while but John Warburton identified is as a 1931 Wolseley 21'60 Straight Eight Landaulette. Reg was Devon CC. Rare car, few made due early teething troubles. Expensive car; two chassis lengths and various formal bodies. Another lovely photo submitted by Jan Ludin (Sweden) 'maybe from late 30's'. -- Our motorcycle expert Robin Vince advises that they are both of European origin as the left side exhausts give this away. He also advises that the machine on the left is a German BMW. In 1931 BMW introduced a lightweight bike with a pressed steel frame. 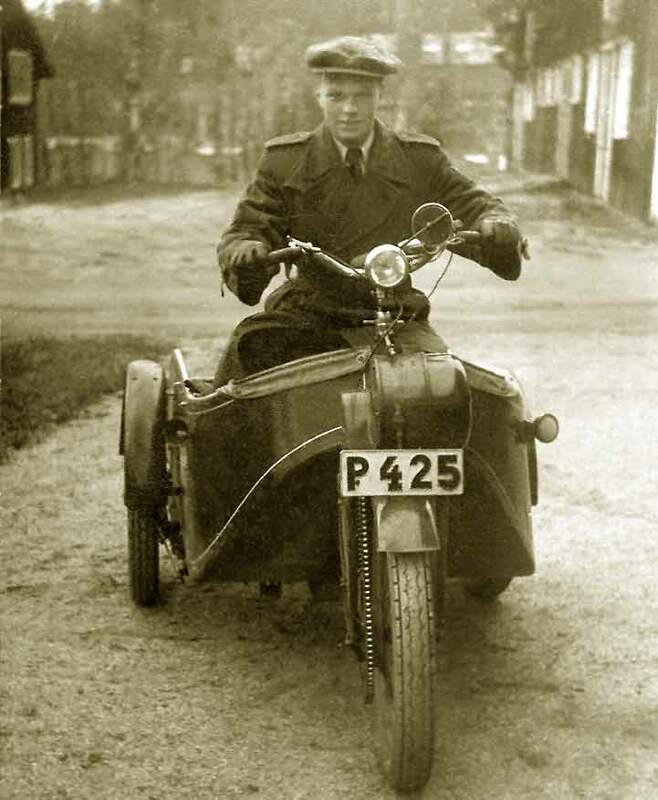 The cutouts on the front mudguard suggest this is a later 1932 BMW R4 Series 1, single cylinder, OHV, 398cc, four stroke, 60mph / 100kph, made for one year. 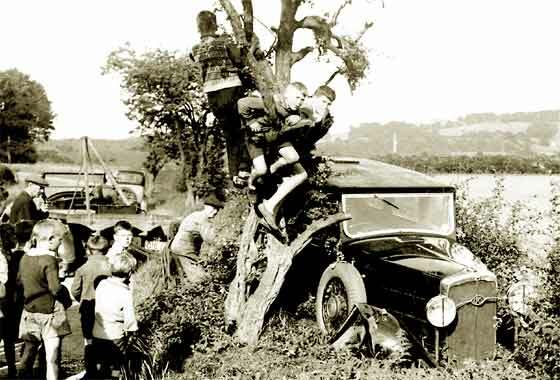 A rather unfortunate but interesting photo received Simon Bishop (UK) via the Singer Magazine showing a crunched car being pulled out of the bushes. Was suggested that the car may be a Maybach, but questioned. -- Definitely not a Maybach, a lot smaller than a typical Maybach, wrong hand drive, wrong logo, and wrong general radiator shape. Radiator top has the typical earlier Rover notched header, by then less pronounced. The logo mid-rad has the RM of a British cca 1932 Rover Meteor Salon. 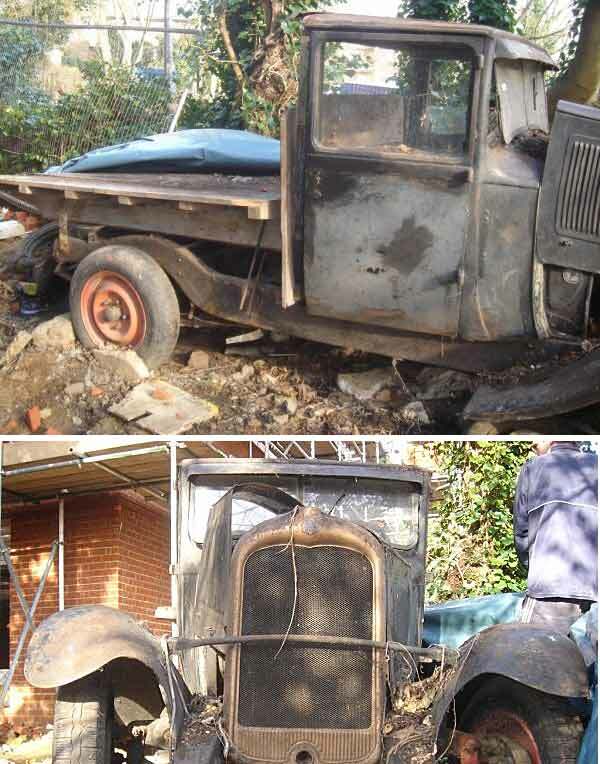 Series of photos received from Jim Paling (UK) from a colleague with an old Citroen pick-up to dispose of. A saloon of the early '30s with the back cut off to become a truck, mainly during the war. He hopes we may positively identify the date and model of the vehicle. May be for sale so if interested, contact him on 0208 531 6422. -- 1932 Citroen C4 cut down car. '31 the wheels had 5 studs instead of 4. Vehicle is so derelict that probably scrap value - no real market for this type of car. 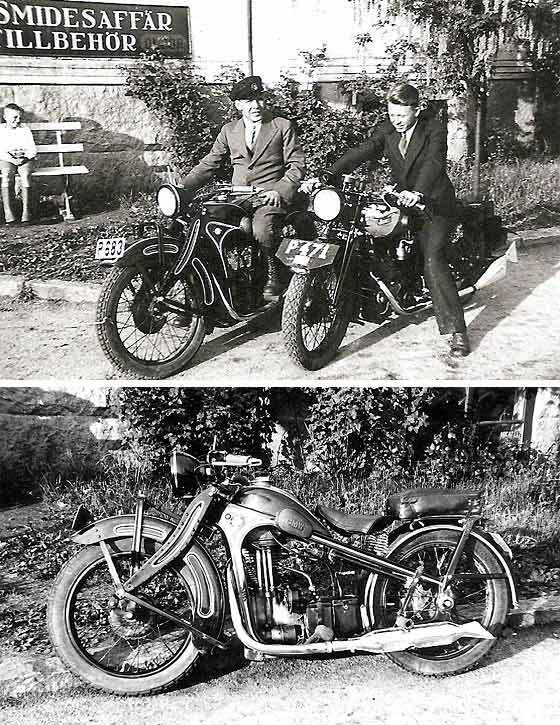 Two more lovely photos received from David Champion (UK) whose father ran a shop in Dorking before WW2 (see Hillman; Help Page 28) and in the earlier 1930's had two Scott Motorcycles. -- Our Geoff Morris advises these are a 1934 and a 1936 Scott, most likely 'Squirrels' and probably 500 cc capacity. They would have been water cooled two strokes with 3 speed gears. Scotts made numerous models and buyers could dictate their own specification, -as on these two lovely examples. Stuart Owen (UK) gave us the photo shown right at the Dinner asking if we could provide any information on this car. It was known to be a Triumph but not much more. Fortunately we had Jon Quiney at the Dinner who knew the car immediately. Jon is a Triumph expert and has a couple of exotic Triumphs himself. Click on 1934 Triumph Gloria 6 Flow Free for the full story. Designed in 'streamline' year for the Olympia Motor Show as a 'windcheater' named 'Flow-Free'. 25 built, none left. Another lovely photo submitted by Jan Ludin (Sweden) 'maybe from late 30's'. 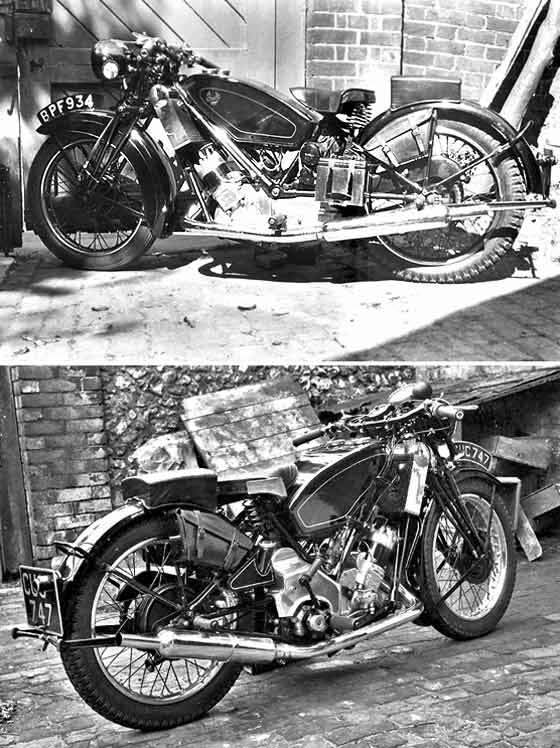 -- Our motorcycle expert Robin Vince thinks the picture is of a cca 1936 Norton Model 30 International factory racer or one provided by the factory for a leading privateer; "pie crusting" around the lower edge of the tank, an overhead camshaft engine and extra, unpainted, large oil tank below saddle for long high speed laps. 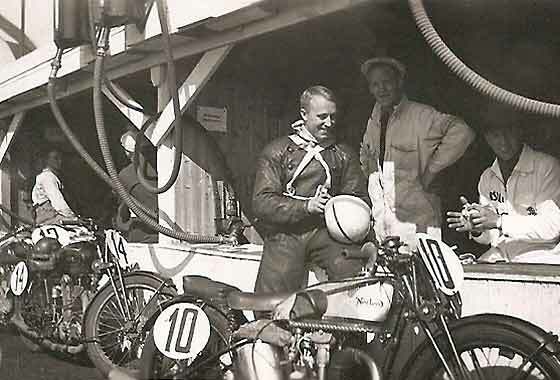 From white crossed number straps, the picture may be from the pits at the Isle of Man TT. Another of a number of very interesting photos submitted by Jan Lundin (Sweden) showing vehicles in the 20s and 30s Scandinavia, for which he is seeking identification and dating. Jan has habit of unearthing unusual vehicles and this really is no exception. -- Electric three wheeled delivery vehicle built by General Motors Nordiska AB in Stockholm during WW2 when there was a shortage of petrol. Info supplied by Casper Friedrich and more info on Konditori's great website. 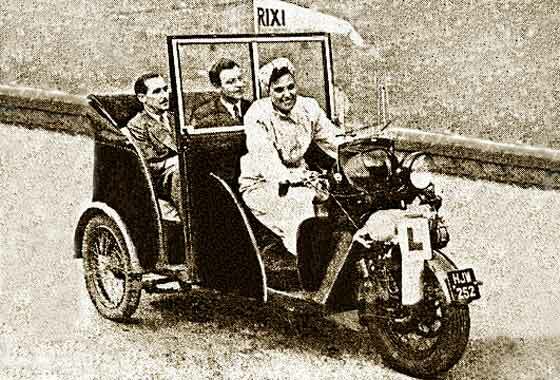 FURTHER INFORMATION REQUESTED: 1950 Three Wheeler Rixie? Question asked by Alan W. Boal of San Clemente, California (USA) if we knew of a 1951 three wheeler light duty delivery truck which might have been named Rixie? His father had one for about a year in 1963. -- We emailed to establish in which country, but did not receive the courtesy of a reply. We are not aware of any manufacturer by the name of Rixie or anything near it. But there was in the UK Turner three wheler Taxi named Rixi destined eastern markets. See great website.